Where did American literature start? The familiar story of Emerson and Thoreau has them setting up shop in Concord, Massachusetts, and determining the course of American writing. West of Emerson overhauls this story of origins as it shifts the context for these literary giants from the civilized East to the wide-open spaces of the Louisiana Purchase. Kris Fresonke tracks down the texts by explorers of the far West that informed Nature, Emerson's most famous essay, and proceeds to uncover the parodic Western politics at play in classic New England works of Romanticism. Westerns, this book shows, helped create "Easterns." West of Emerson roughs up genteel literary history: Fresonke argues for a fresh mix of American literature, one based on the far reaches of American territory and American literary endeavor. Reading into the record the unexplored writings of Lewis and Clark, Zebulon Pike, Stephen Long, and William Emory, Fresonke forges surprising connections between the American West and the American visions emanating from the neighborhood of Walden Pond. These connections open a new view of the politics--and, by way of the notion of "design," the theological lineage—of manifest destiny. 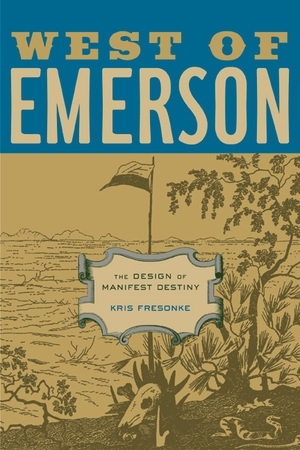 Finally, Fresonke's book shows how the cast of the American canon, no less than the direction of American politics, came to depend on what design one placed on the continent. Kris Fresonke is Assistant Professor of English at Adelphi University.